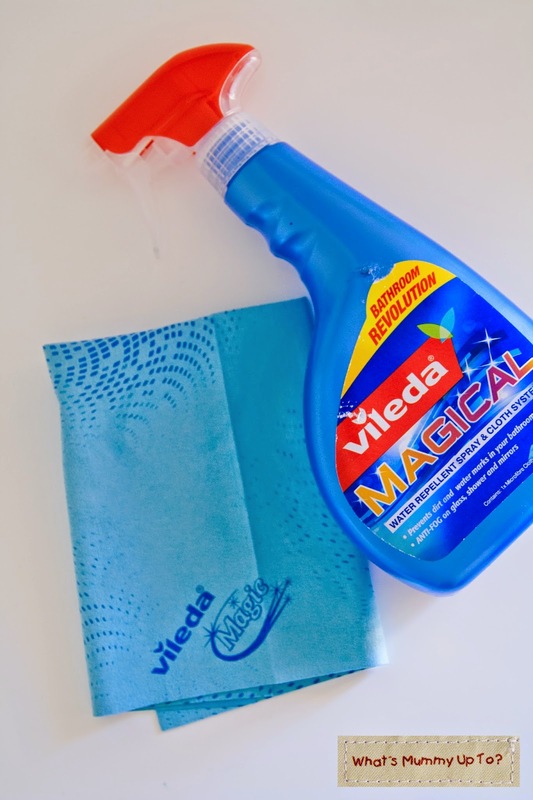 I was recently offered an opportunity to review the new Vileda Magical Water Repellent Spray and Cloth System in exchange for my comments, and I thought ... why not? It's fun to try new products that I would otherwise not have known about, and to see what I think ... and this is definitely something that I probably would never have noticed in the absolutely huge amount of time I spend in the cleaning aisle ... especially with just how much I just LOVE to clean ... cough ... like NEVER! So reviewing this type of product was a little different for me. Anyway, it's not all that different from waxing your car I guess (except it's heaps easier on the elbow-grease) and it does work! 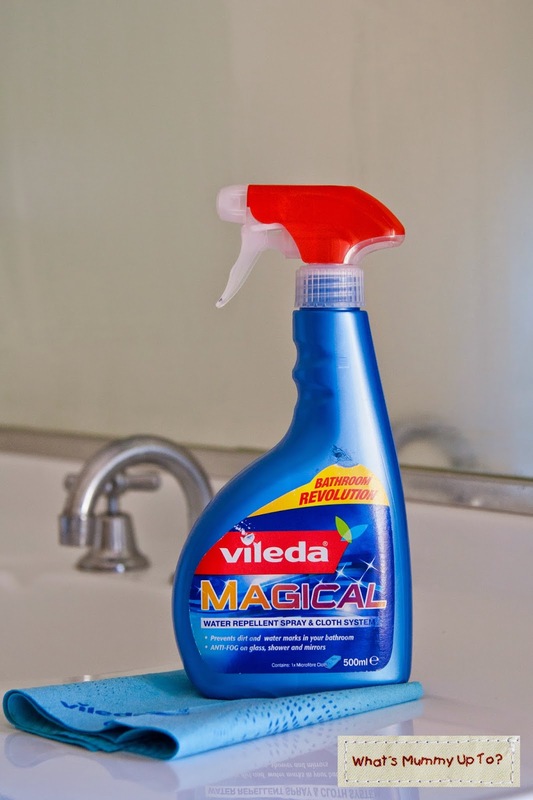 I tested it out by giving my bathroom mirror a bit of a clean just with a damp cloth, then sprayed a line of the Vileda Magical Water Repellant Spray down the middle of the mirror, and wiped it off with the special blue cloth that came with the bottle. I armed Daddy with the camera (poor Daddy is always pulled in for Mummy's crazy capers!) and turned the hot tap on in the shower for some steam. It was like a win-win for Daddy! He's got a bit of a cold at the moment, so he scored a free steam inhalation as well as a chance to take some photos ... I'm totally sure he saw it that way too! So, sure enough the mirror fogged up. All except for the strip down the middle which stayed crystal clear. It was pretty impressive! Now I'll be truthful and admit that I am NEVER up at the ridiculously early time that Daddy gets up to go to work. So we don't have that problem in the mornings of one person in the shower, while the other is trying to see in the fogged-up mirror to do their hair. But I can imagine that if you're not as lucky lazy as me, and do share the bathroom in the mornings this would make life easier. No more wiping down the mirror with a towel only to have it fog up a minute or so later. One less thing to do in the mornings, hey. That totally equates to a few more precious minutes of sleep in the mornings I reckon! Anyway, all in all an effective product. I only did my test run today, so I haven't witnessed how long it lasts before you have to wipe the mirror over with more spray, but the instructions suggest that you can extend the fog-free-ness (yep, I've made another new word) by using a little more spray. You can check out the Vileda Facebook page here for more information, and the Vileda Magic System is available at Woolworths and Big W for $9.99. Oh, and I was provided with this product in exchange for my comments. All opinions are my own.